Bratislava, capital city of Slovakia, is often considered a detour: a day trip; a way to fill in the margins of a tour itinerary which focuses on more well-known cities like Budapest or Vienna. Locals often wince at well-meaning tourists asking which way is Czechoslovakia (Czech Republic split from Slovakia in 1993). Bratislava might be placed a little more off the beaten path but sure is worth a visit. In fact, its easy accessibility – just one hour from Vienna, two hours and 40 minutes from Budapest, and around three hours from Prague with easy train and bus connections – is only one of the many reasons why Bratislava makes an excellent getaway. Another great reason to visit Bratislava? It is about half the price of those other bigger flashier cities. The first thing to do when arriving in Bratislava is to join the free three hour walking tour. Tours are in English and depart twice every day at 11am and 3pm from outside the US embassy. Visitors will see the National Theater, Old Town Hall, St. Michael’s Gate, Blue Church, and the Site of the 1968 Soviet Occupation amongst other popular landmarks in Bratislava’s history. In truth, the winding cobblestone streets of the Old Town and the lonely castle perched high on a rocky hill look like images from a fairy tale. While the interior of the fortress is closed to visitors, it is possible to wander about the ramparts and look over the castle walls at the Danube River below. Of course no visit to Bratislava is complete without trying the traditional cuisine and a pint of locally made beer. Just a few meters below the castle is Zámocký Pivovar. The pub is one of several stops that beer enthusiasts should try throughout the city. Starosloviensky Pivovar is one of Bratislava’s newer microbreweries which is also worth a visit. For lunch try delicious dishes like Halušky (dumplings with sheeps cheese and bacon). Later on, stroll through Bratislava’s pedestrian only streets in the old town to find a traditional pastry like Bratislavske rozky for dessert. 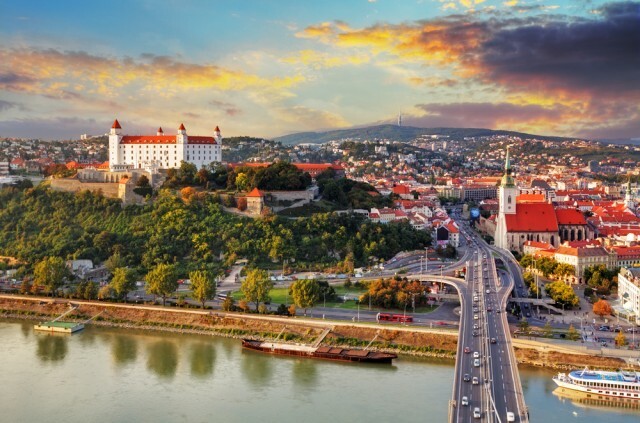 Whether you just passing through, or Bratislava is your final destination there is lots to see and do in this vibrant Eastern European capital. Share your recommendations for best stops during 24 hours in Bratislava or your favorite city!